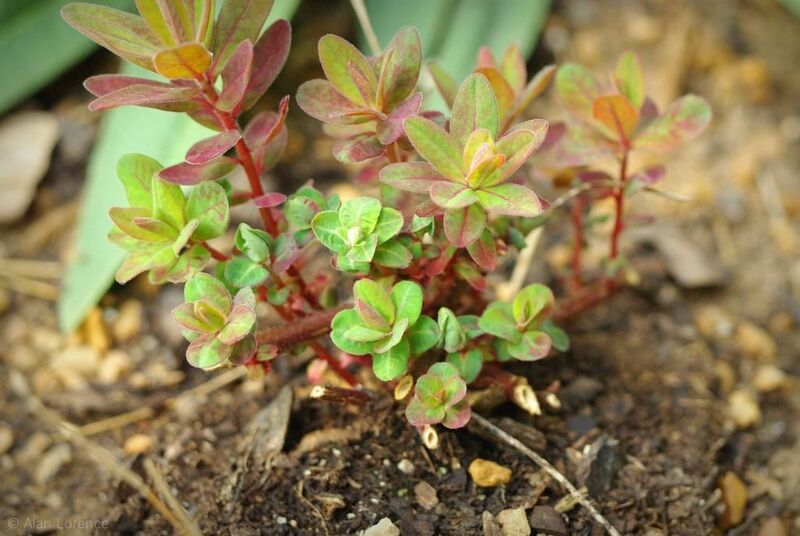 Did you know that Euphorbias can and do fall victim to herbivores? I thought these contained toxic sap? My recent addition was nibbled down to a stump. At only 2" (5cm) tall in the above photo, I wonder when it will get to a size to be noticed and "pruned" again? Did you also know that the same critter also eats Hakone grass ( Hakonechloa macra)? I didn't think anything would eat this, but as you can see I was wrong. Perhaps it was because this was a relatively small clump, divided from my main plant? 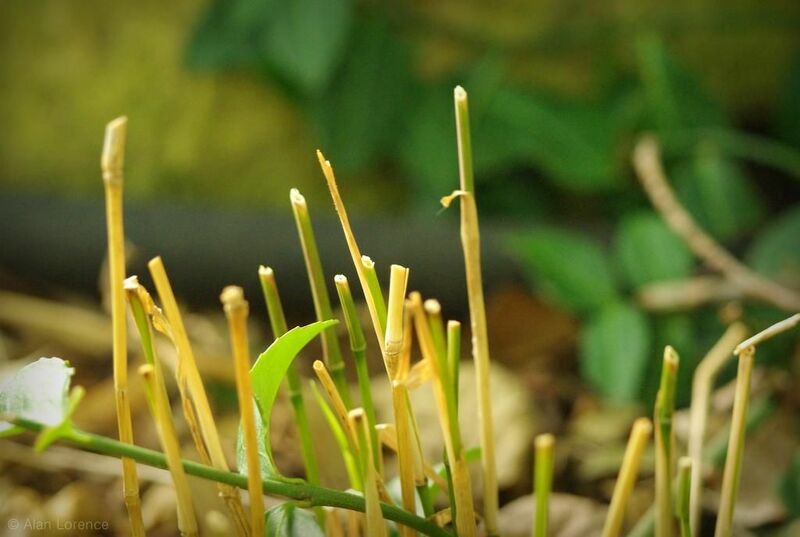 Did you know that growing bamboo rhizomes at the soil surface is the plant's way of tricking you into thinking that it's not spreading much? Well, this isn't entirely true. 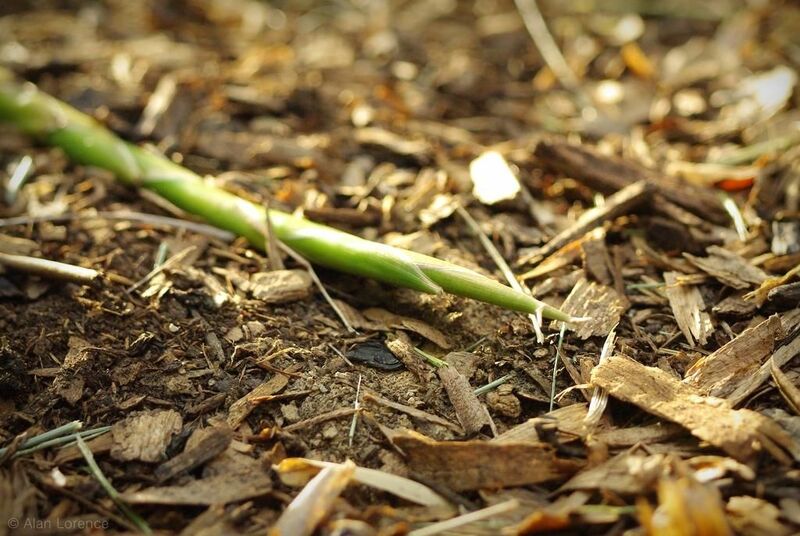 Certainly it's easy to think that visible rhizomes mark the outer extent of the plant's spread, but don't be fooled by this -- it's spreading underground too, and probably further than you think. So rhizome prune anyway! Do you know what this weedy grass (or grassy weed) is? It usually grows in my driveway cracks and I pull most of it, but when it grows in a nice spot I leave it. 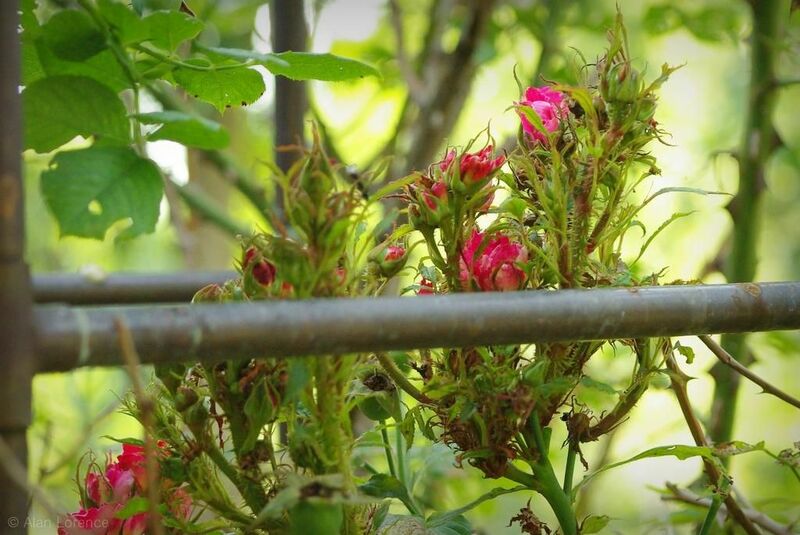 Do you know why my climbing rose (dubiously tagged as 'Fourth of July') is developing these witches brooms? It's happening in three different places. 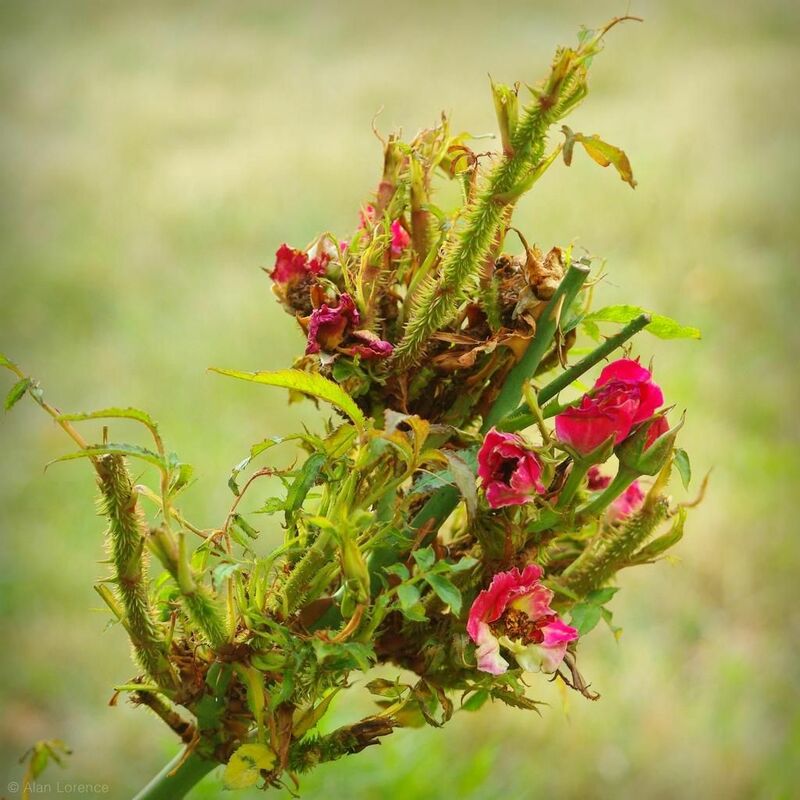 Is it rose rosette disease? Does that mean I need to remove this plant? (It seems like there is no cure...) This wouldn't be a bad thing, since this rose has been a disappointment, but it would be a not-to-much-fun task. 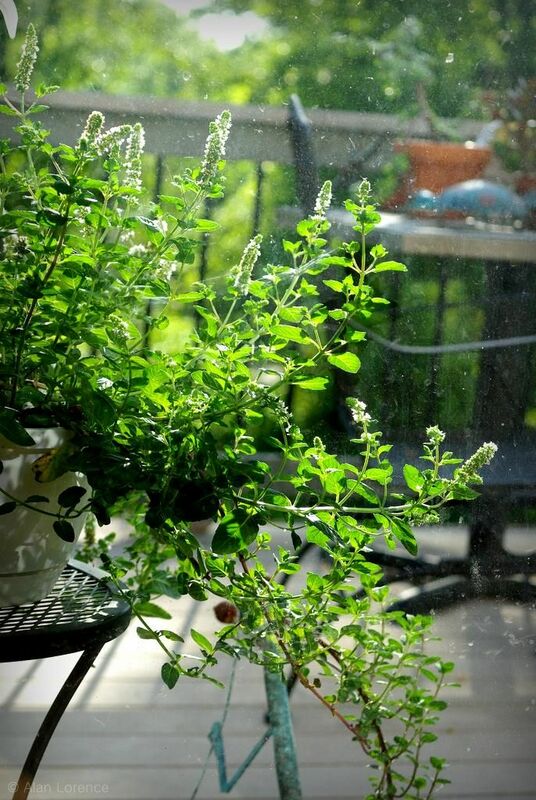 Did you know that mint can make a wonderful hanging basket? This one is "Berries and Cream" -- I don't know if all mints would trail as nicely. Even when grown as an annual, it gets really large by the end of the summer from a very small plant purchased in spring. I'd be sad all summer long if I didn't have this in my garden! 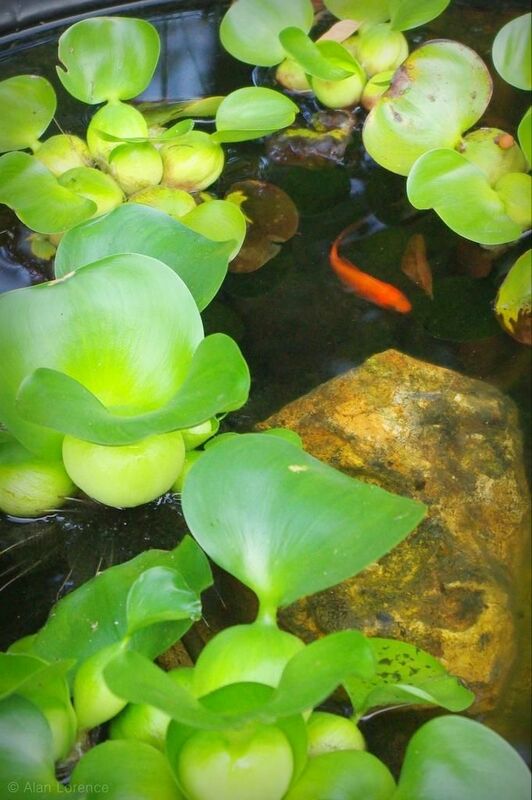 Finally, did you know that adding even a single fish to a water feature makes it come alive? Answers if you have them please. Share similar questions too, all in the comments. Thanks! Euphorbia is my new found obsession - love all the varieties, but especially "Bonfire". And rabbits - large rodents that trick people into thinking they are cute. Destructive little nibbling machines! I love my papyrus - in big pots they make a big show! And boy is it fun to try to get the massive rootball out of the pot at the end of the year! Many mints will trail, especially if you crowd them a bit in the pot. That's all I've got - no real help here! But I'm totally with you on the fish - they are mesmerizing! Her research says to dig them out - do not put them in compost pile - and to plant something else in that spot rather than another rose. Lisa: how do you not crowd mint in a pot? It's self-crowding! 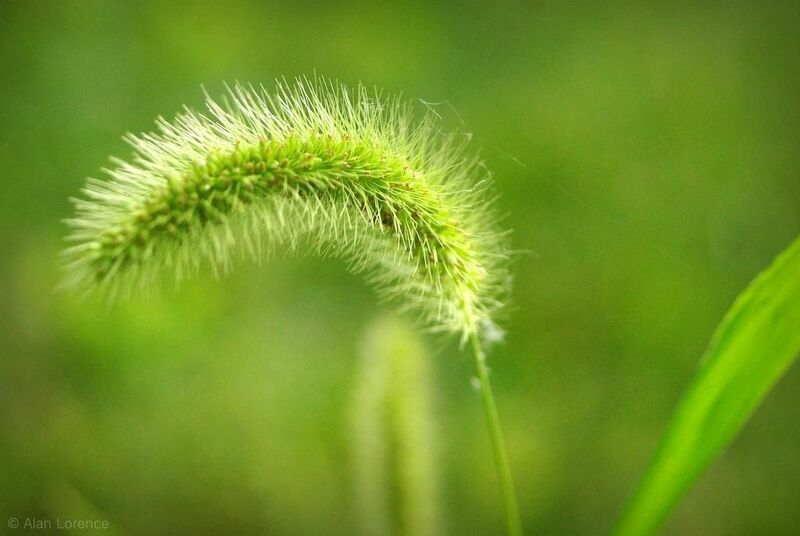 Your weed is foxtail (Setaria). It will inhibit the vigor of plants around it. Spreads like the weed it is too. Some types are consider noxious. Haha! True. Just crowd it from the get-go and it will look for room to spread. Slightly surprised with the Euphorbia, but I suppose some herbivores are resistant to it. And definitely agree on the fish, they are fun to watch and somehow makes a little pond and/or water feature complete. Did you mean the grass or the flower? 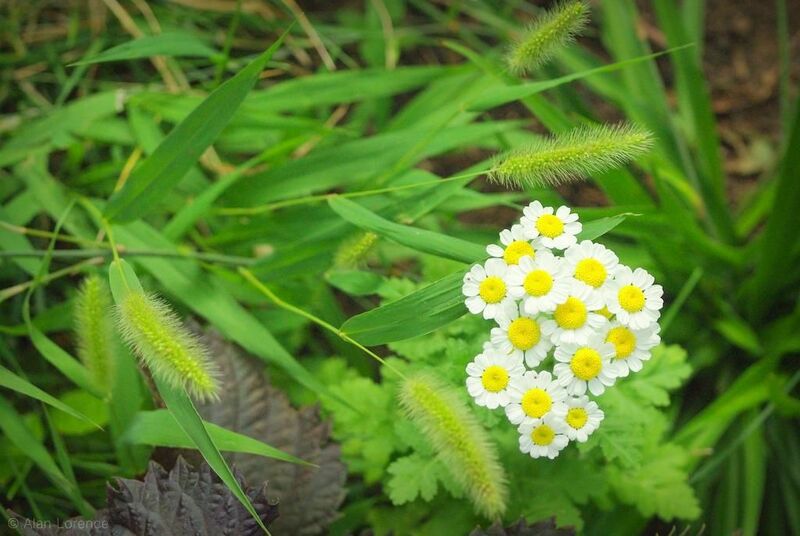 the flower is feverfew. 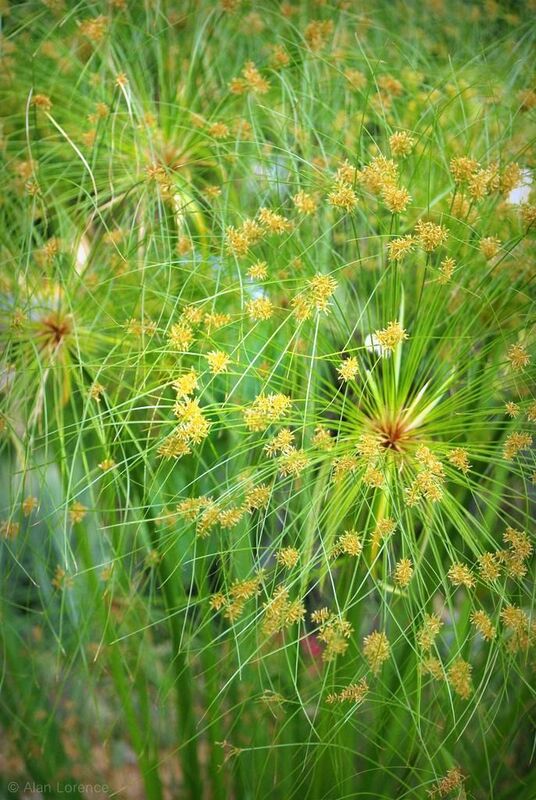 Did you know that Papyrus (Cyperus papyrus) makes a great cut "flower?" I don't bother to over winter mine as they are so slow to get started in the spring, I just buy a new one. However the day before our first killing frost is predicted I cut mine back completely and stick the stems in a big vase. They last for weeks and have become a thanksgiving tradition around here. Loree: you must have some BIG vases. My papyrus is about 6' tall, with "heads" that are about a foot in diameter (once they seed). I have a dwarf papyrus that has been somewhat disappointing but only gets 18" tall or so. I'm growing papyrus for the first time this year and I LOVE it. I don't think I'll ever be without it again.